You are here: Home / Holiday / St. Patrick's Day / Happy St. Patrick’s Day! If you’re on a last minute search for a St. Patrick’s Day recipe and feeling desperate, here’s tip. :Make whatever you want and put green sprinkles on it. Not a good enough tip? How about a lovely green Midori Cake. Happy St. Patrick’s Day from Cookie Madness. Love cakes made with booze. Yum! Happy St patrick’s day to you too! I don’t know what Midori is, but I’m going to find out. I do love pistachio and yellow cake mix. 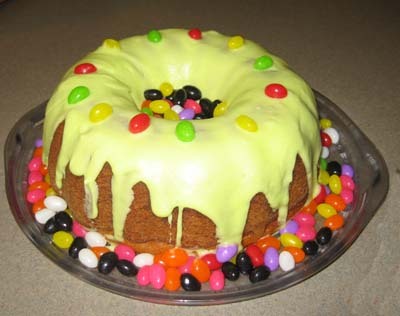 Never thought to load up the middle of a bundt with jelly beans, but it is pretty and fun looking. For tonight my Irish husband is going to need to be happy with a green St Paddy card,,,,,oh well!